Some good news! Ontario has decided to end the hunting of snapping turtles. This is good news for a variety of reasons, not the least of which is that it never made sense to allow these animals to be hunted in the first place. As I blogged before, their meat is filled with environmental toxins, so they shouldn’t be consumed. So, barring eating them, why else would someone hunt them? Perhaps to sell them to the lucrative exotic meat market. But that was (and still is) illegal. So there wasn’t a good reason to allow hunting. The other reason is that this is good news, is that the snapping turtle is listed as a species of special concern under Ontario’s Endangered Species Act as well as by the federal Committee on the Status of Endangered Wildlife in Canada (COSEWIC). Even without hunting, they face multiple threats including habitat loss and a high incidence of road mortality. So this new ruling takes at least one pressure off of snapping turtles. “Ending the hunt helps to give snapping turtles a fighting chance and frees us up to focus attention on dealing with other threats such as wetland loss and road kills.” —Anne Bell, Ontario Nature conservation and education director. So what caused this change of governmental heart? Quite simply, activism. I was one of those thousands of people, so I’m pretty happy our voices were heard. That photo at the top is one of the snappers who laid eggs in my yard last year. I’m relieved to know she and her immensely cute offspring have one less thing to worry about. 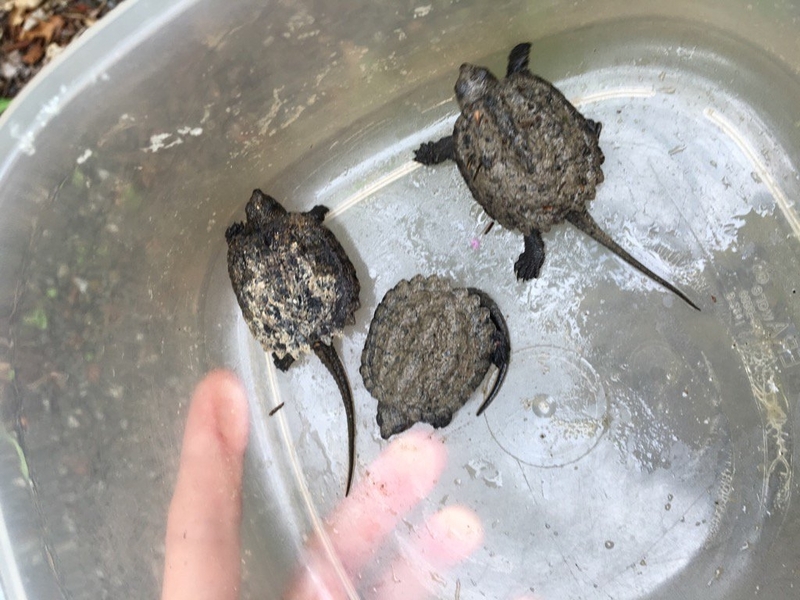 To meet the rest of my resident snappers, check out last summer’s blog post here: Sweetfern Field Notes: The Summer of the Snapper.